Last week Ben VanderWeide, our township’s Natural Areas Stewardship Manager, had to mow large sections of the golden prairie to prevent seed production in the invasive and aggressive Spotted Knapweed (Centaurea stoebe). We hope the mowing will reduce knapweed abundance and give native plants a competitive edge as they continue to fill in throughout the field. 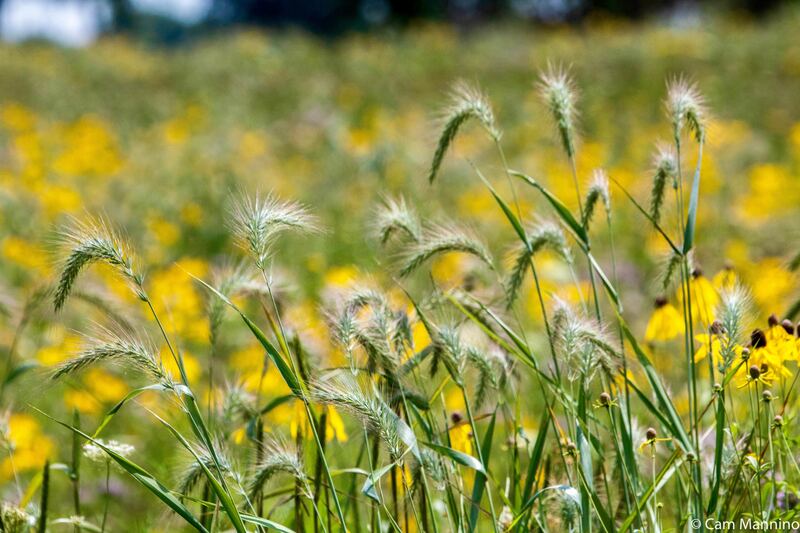 The prairie, though, is still a beautiful sight since it signals the return to our parks of graceful native wildflowers and grasses that sway in a summer breeze. Native Canada Wild Rye nods and sways within the gold of the Draper prairie. The more our prairies are restored, the more they attract a whole panoply of colorful butterflies. Giant Swallowtails (Papilio cresphontes) seem to be everywhere this summer. It may be that our hot July has encouraged more of them than usual to migrate up from the south to breed. And once they arrive, our prairies provide generously for them. This huge butterfly flutters constantly while feeding, though it floats elegantly between flowers, beating its wings briefly and then gliding along. 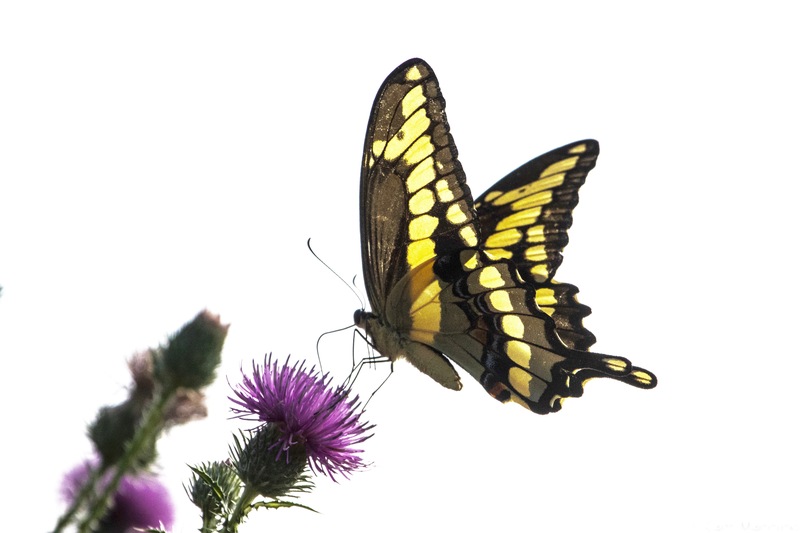 The Giant Swallowtail flutters constantly while feeding though it is an elegant flyer. 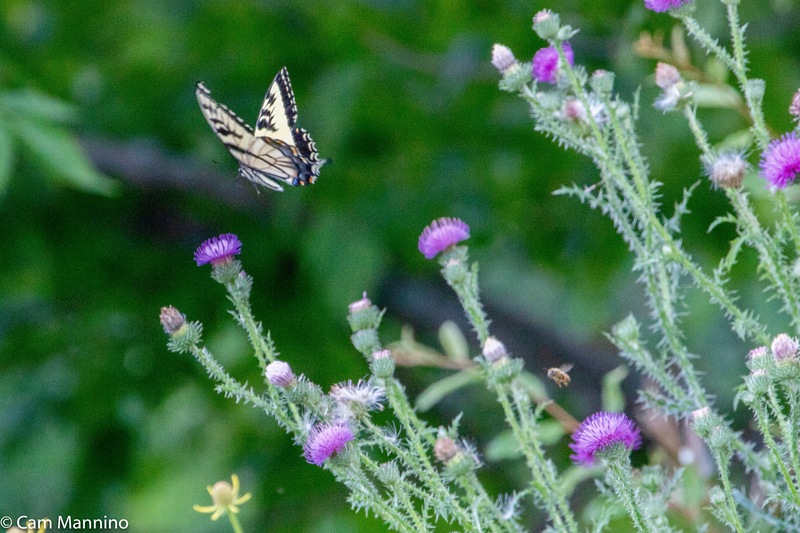 An Eastern Tiger Swallowtail (Papilio glaucus) swooped out of a patch of Plumeless Thistle (Carduus acanthoides) and soared across the prairie. I believe the blue spots at the bottom of the wings mean it was a female. I never noticed before that they have such a fancy striped body! An Eastern Tiger Swallowtail female exits from a stand of Field Thistle. Red-spotted Purples have no small “swallowtails” on the bottom of their hind wings. The red dots on the lower side of the forewing give the Red-spotted Purple its name. A small Viceroy (Limenitis archippus) butterfly landed on a Queen Anne’s Lace flower (Daucus carota) in front of the birding group. Mike Kent, a fellow birder, slowly and gently extended his finger and this little one climbed right on. A few moments after this photo, it started “tasting” his skin with its long proboscis! Quite a magical moment! 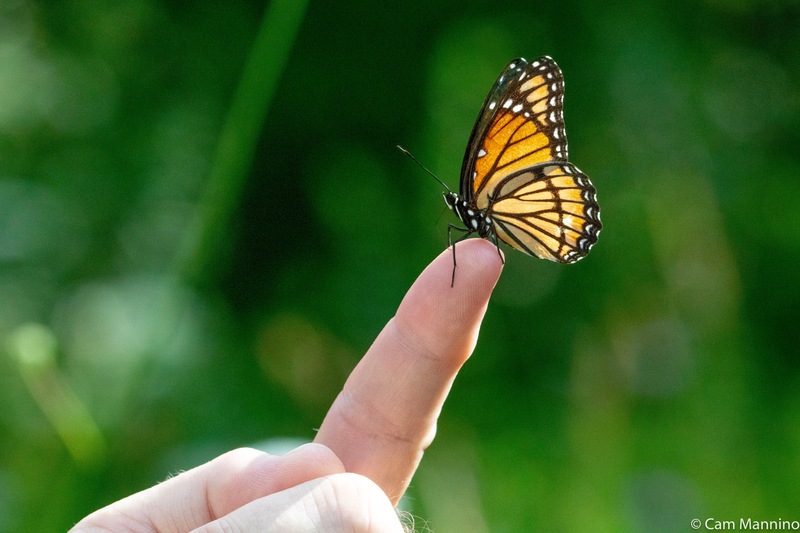 A Viceroy butterfly climbs onto a birder’s finger from a nearby bloom. A few smaller butterflies and other flying insects are fluttering across the prairie this summer. 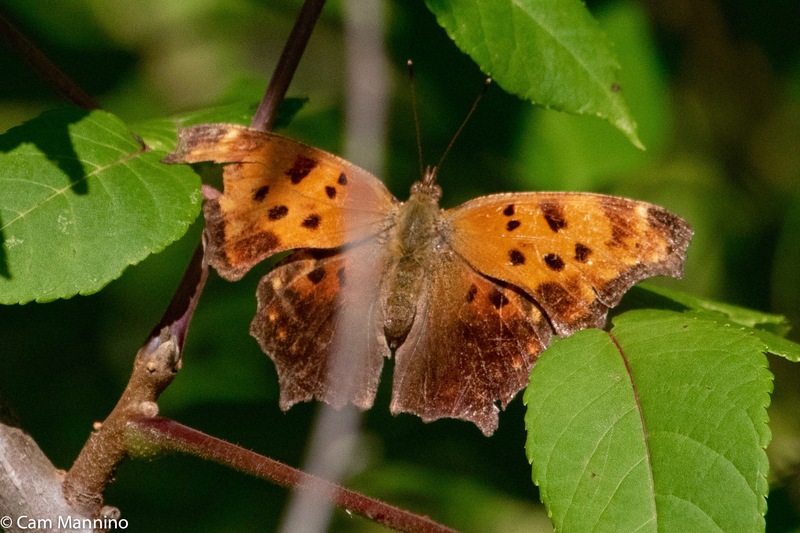 The Eastern Comma (Polygonia comma) is an early spring arrival and looks a bit battered by now. An Eastern Comma that looks a bit battered! 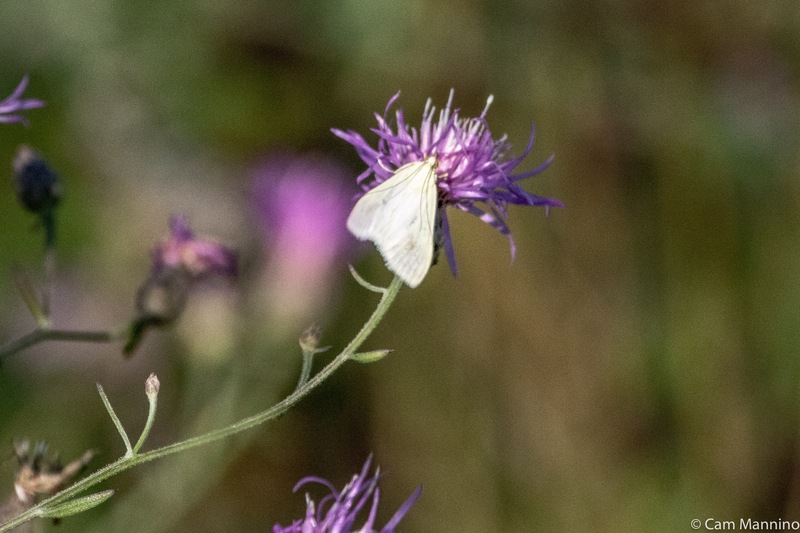 The tiny white Carrot Seed Moth (Sitochroa palealis) is a non-native from Europe who, consequently, sips on many non-native European plants like Queen Anne’s Lace or here on non-native Spotted Knapweed. Thanks to Dwayne Badgero on the Butterflying Michigan Facebook page for identifying this one for me. The Carrot Seed Moth is a non-native who feeds largely, though not exclusively, on non-native plants like the spotted knapweed shown here. 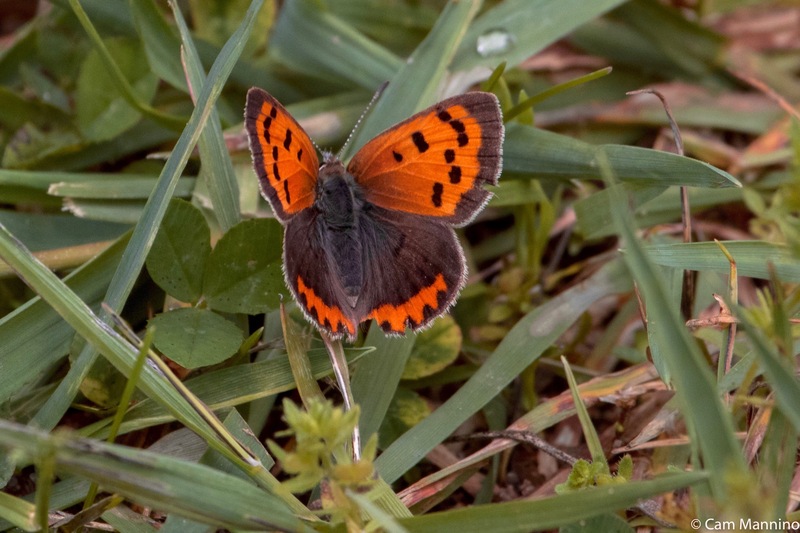 I saw the lovely American Copper (Lycaena phlaeas) on the Draper prairie earlier in the season, but never got a shot. The photo below is one I took at Cranberry Lake Park. I saw an American Copper on the prairie, but this photo was taken at Cranberry Lake. This juvenile male Widow Skimmer (Libellula luctuosa) has a faint white band on its wing which will get bolder as it matures. Also, its abdomen will slowly develop a white covering. The adult females have no white band and keep the darker abdomen with the golden stripes. 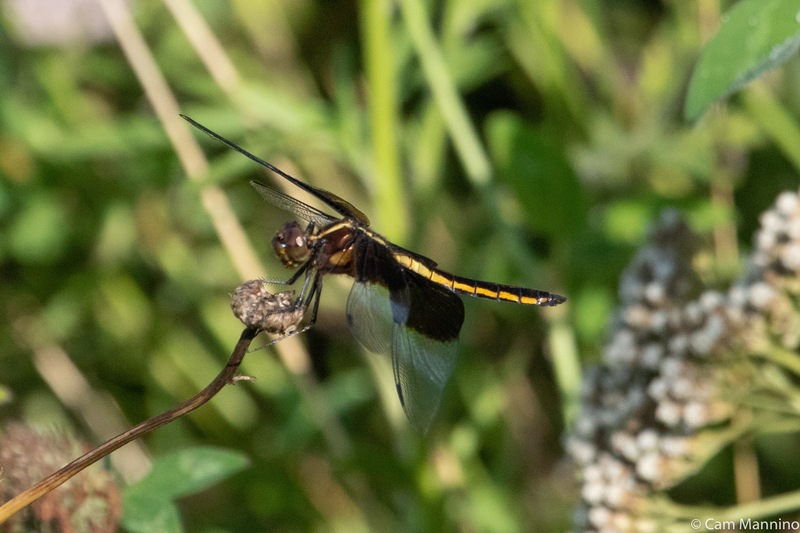 The juvenile male Widow Skimmer has a faint white wing band that will be more noticeable when it matures. A Carolina Locust (Dissosteira carolina) used its stiff wings to fly up onto a Gray-headed Coneflower as the birders walked by. 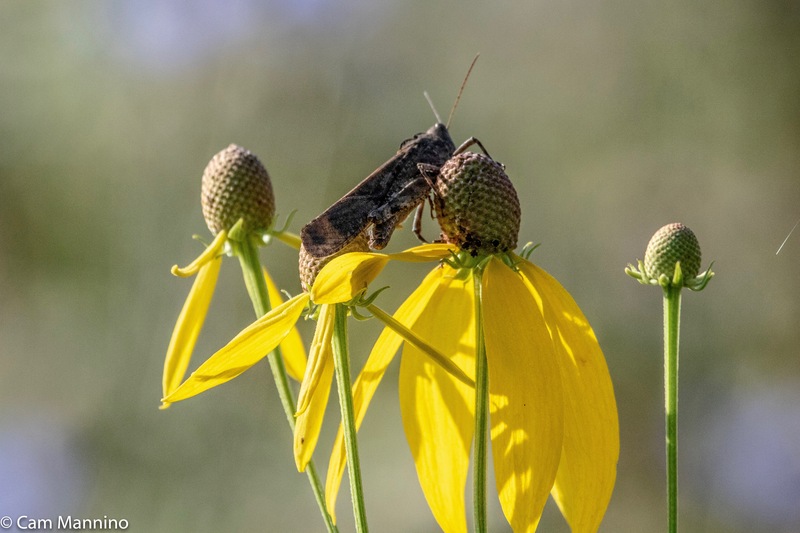 A Carolina Locust grasps a Gray-headed Coneflower. Two larger fledglings appeared on the trail between the marsh and parking area. They hopped along the edge, pecking at the earth in a desultory fashion, but repeatedly stared up longingly into the trees. We didn’t recognize them at first. Then my husband noticed a sharp clicking in the trees and we suddenly spotted an adult Brown Thrasher (Toxostoma rufum) moving stealthily through leafy branches overhead. Aha! These were two juvenile Thrashers out practicing their foraging skills! The telltale field marks are the light colored heads, scalloped backs and gray (rather than yellow) eyes. A juvenile Brown Thrasher staring up into the trees. A second Brown Thrasher youngster looking about a bit helplessly. Brown Thrasher adults are notoriously hard to see. On Sunday, the adult stayed hidden in tangled bushes, vines and leafy branches, as Thrashers most often do. But after a frustrating few minutes, the annoyed adult emerged and demonstrated his displeasure at our proximity to its young with a yellow-eyed glare and a wild tail display! 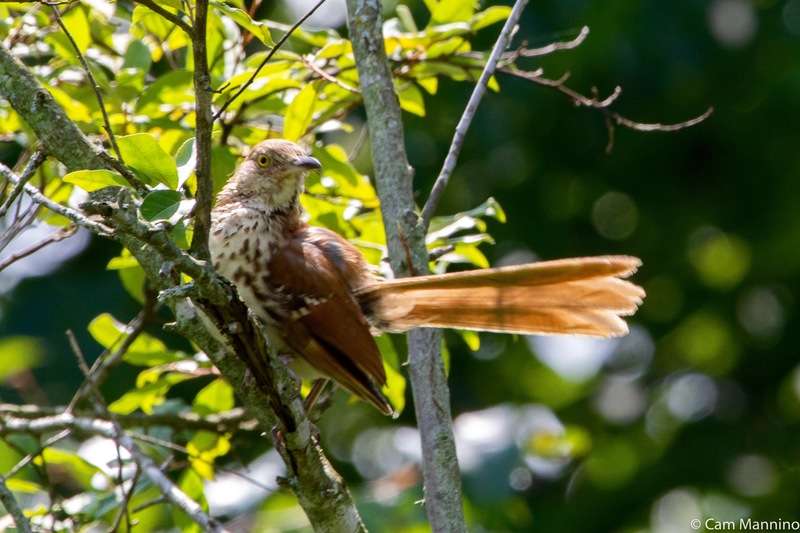 The adult Brown Thrasher show his irritation at our presence with a fantastic tail display. In spring, high in the treetops, Brown Thrasher males sing their wildly variable song, made by mimicking Flickers, the Tufted Titmouse, the Cardinal and others. And that click we heard overhead on Sunday was an alarm/warning call that both Cornell Lab of Ornithology and the Stokes’ Guide describe as sounding like a smacking kiss! And it does! Listen to both the creative chaos of the song and smack! call at this Cornell link. 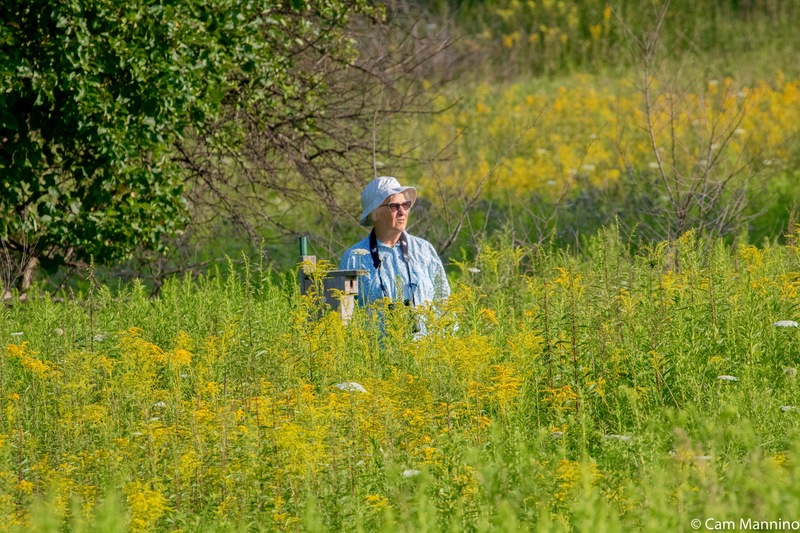 Donna Perkins, a birder and one of our volunteer nest box monitors, waist deep in goldenrod on a summer morning. The hard work of Ben VanderWeide and his crew in clearing, seeding and tending the natural areas of our township is paying off magnificently. Just as expected, the wildflowers and grasses flourish when given the opportunity. And as they return to their former glory, back come the butterflies, the grasshoppers, the dragonflies, and the bees. And after them, we hope, may come more of the prairie birds that used to live with us, like the Eastern Meadowlark (Sturnella magna), Henslow’s Sparrow (Ammodramus henslowii), and perhaps even the long absent Northern Bob-White (Colinus virginianus). Already less common prairie birds, like the Savannah Sparrow (Passerculus sandwichensis) which I saw earlier this summer at Draper Twin Lake Park, are looking for mates as they ride the stems of prairie plants. 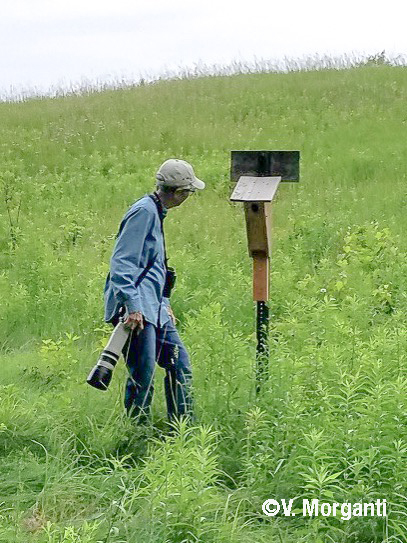 Ben’s stewardship program is also helping to restore bird populations and providing citizen science data by setting up nesting boxes in two parks and along the Paint Creek trail. The volunteers who monitor these boxes watched multiple broods of Eastern Bluebirds, Tree Swallows, House Wrens and Black-capped Chickadees go from egg to fledgling just this year. Birders on a Wednesday morning in July at Draper Twin Lake Park. And let’s not forget us humans. We’re also out in the our parks more these days! 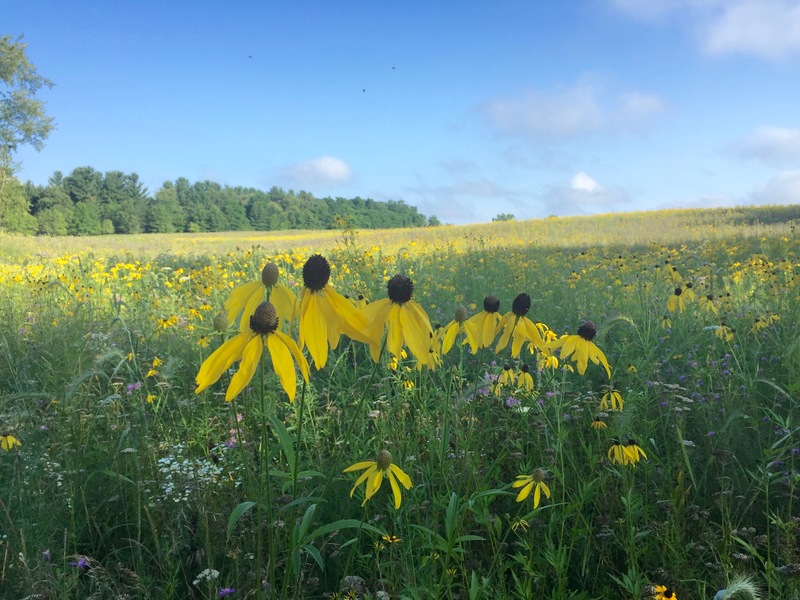 As Ben, his crew and volunteers restore our colorful prairies, people come out to enjoy the natural areas that township residents have been committed to preserving and protecting for many years. 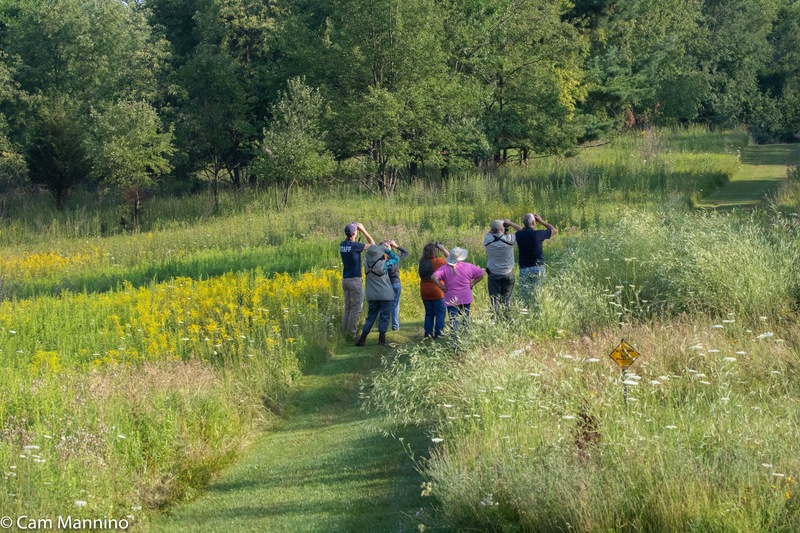 Our birding group has grown consistently year by year, exploring and recording bird sightings for Cornell’s eBird citizen science program even on the coldest winter, the rainiest spring and the warmest summer mornings. The schedule is under “Events” at the top of the page. Please come join us! Ben will even lend you binoculars. We’re restoring ourselves as well while we preserve, protect, and delight in our small green corner of the world. Footnote: My sources for information, besides Oakland Township's Stewardship Manager Ben VanderWeide, are as follows: inaturalist.org; Allaboutbirds.org, the website of the Cornell Lab of Ornithology at Cornell University; Wikipedia; Herbarium of the University of Michigan at michiganflora.net; various Michigan Field Guides by Stan Tekiela; Butterflies of Michigan Field Guide by Jaret C. Daniels, A Guide to Bird Behavior Vols.1-3 by Donald W and Lillian Q.Stokes, and others as cited in the text. Have you tried our Wednesday morning bird walks? Perfect for birders of all skill levels, our group has fun exploring the parks while documenting the ebb and flow of local bird life. All walks in winter and spring 2019 start at 8:30 am. For more information check out the “Birding Walks” page under “Stewardship Events.” Hope to see you out there!